What a crazy bunch o’ fun working on this show was. We shot four episodes in March of 2016, then CBC Comedy got involved and we shot another two in November. Watch all six episodes HERE on the CBC Comedy website. Ottawa has very politically savvy audiences. Weird. If you get drunk on scotch and pickle juice after the first big day of taping, your nickname will forever be Pickle Juice. PJ for short. Categories CBC Radio, The Debaters, Things about ME! Don’t make me tell you again. Tights are NOT pants. And then put on some real pants. Categories CBC Radio, The Irrelevant Show, Things about ME! Click HERE to listen to this sketch I wrote for The Irrelevant Show on CBC Radio. It’s a slow burn…wait for it! Click HERE to give this sketch I wrote for The Irrelevant Show on CBC Radio a listen! 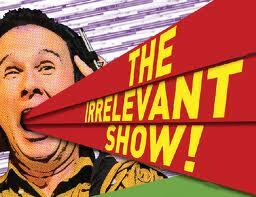 Or if you’d like to hear more from The Irrelevant Show, click on THIS! Hey pals! 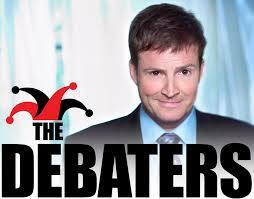 If you are a fan of the CBC Radio comedy show ‘The Debaters’ and are also a fan of me hating on e-books, then listen in on Wednesday September 10th at 11:30am! My debate against the hilarious Patrick Ledwell was hard fought and one of us got the book thrown at them.